There is an ever growing number of Bible apps for the Kindle Fire, and it's not easy keeping the overview, especially choosing a suitable app for your Bible reading. Some contain a lot of advertising, others require a permanent internet connection, or similar restrictions. Others focus on a certain denomination, or provide additional features. We've picked the best Bible apps for you, and compare features, languages, available translations etc. We only consider apps that are backed by a Christian publisher, Bible Society or authoritative open source project. We no longer list apps provided by individual developers. Although I don't doubt that most of the individuals who upload their apps to the various app stores for free download have the best intentions in mind, I also discovered authors who offer apps with occult or sexual content side by side with their Bible apps, or place lots of advertising right on the Bible reading screen. All apps have been tested on the Amazon Kindle Fire (2015 model). Of course they are usually available on the Google Play store and other Android app stores for other devices as well. The Faithlife apps are the flagship among all Bible apps. They offer more features, and of course, therefore handling is a bit more complex than most other Bible apps. The target audience includes pastors and Bible school teachers, and the availability of advanced functions and resources reflects that. The Faithlife apps come in six different "flavours". Each app grants access to a different set of free resources (Bibles, Christian writings, and a few secular writings). When you create a Faithlife user account, you get access to more resources than without Logos account. The preinstalled resources differ depending which app(s) you choose to install. They are usually only available when the device is online. For offline use, resources need to be purchased, however, a good number of them is available for "free purchase" (Logos Wiki). We also run a mailing list that sends out notifications whenever free resources become available. We especially recommend adding the free "Basic" packages from Logos and Verbum, which come with a bunch of good resources and features. Special tip: if you complete your user profile 100%, and sign up for "personal offers", you receive a $20 gift voucher for your birthday every year, which gets you two Bible versions on average, or some other nice resources from the Logos, Vyrso or Noet ebook stores. Purchased resources are shared between all the apps, and in the Logos web reader; you can also install the powerful local Logos Bible study suite on a PC or Mac that gives you access to all your purchased resources as well as advanced Bible study tools. The full potential becomes available when you choose to invest some money, but even the freemium versions are more advanced than what you get from other apps that are completely free (in terms of functionality, not in terms of included resources). However, even without paying, you can collect an impressive library over time, as your collection of free material grows constantly. The works in the library in most cases are not merely the plain text, but contain lots of cross-references and hyperlinks, and each chapter or sometimes even every word is tagged with labels for the word and topic guides. Many Bible versions for example have every word tagged and linked with lemmas, Strong numbers and other information. The major downside of this set of apps is that the popular NIV is not included for free, not even for online use, and the process to grab the free ESV is somewhat painful. But then, you only need to be patient for your next birthday, and apply the birthday credit you receive - or just invest $10 to download your favourite translation. Now for the differences between the six "flavours" of the app. The "Bible" app is the default choice without denominational bias, and geared towards professional theologians and seriously interested lay people who seek to study the Bible deeply. It comes with a number of theological resources for free online use, including a broad variety of Bible versions. Vyrso is the easy-to-use, easy-to-read version of the software that has less functionality and is made for users who mainly want to read the Bible and popular Christian books, and only occasionally do some deeper research studies. The app comes with a range of fiction and non-fiction books by popular Christian authors - stuff that you would expect to find at any Christian book shop. The Faithlife Study Bible as a resource (with Bible dictionary, maps, photos etc.) is included in all Faithlife apps. 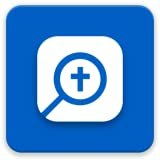 What makes this Study Bible app unique is the integration of that material directly into the user interface of the app. You don't need to open the individual resources, but go to the table of contents instead, and look for the passages you want to read. All the photos, videos and infographics are integrated and easily accessible as you read the Bible. This app has more functionality than the other Faithlife apps, however, severely lacks additional free resources. Verbum is the Roman-Catholic flavour of the Faithlife apps. It features the same functions as the Bible app, and comes with a slightly smaller number of Bibles and other resources. However, it has a very strong emphasis on Roman Catholic works, for example, it greets you with the current lectionary readings. Biblia is not simply a Spanish translation of the Bible app (in fact the Bible app has its own Spanish translation). Biblia comes with a large number of Spanish language Bibles and other works. Apart from that, it's identical to the normal Bible app, though it lacks the original language versions. Noet is the Faithlife flavour for scholars of ancient languages, and Christian as well as secular classics. It does not include additional Bible versions, but a range of free classic works both in their original language as well as their English translations, starting from Homer up to the Victorian era. Some of these works are also available for offline use. Bible.is has been made available in conjunction with the Jesus film project, and not only features 1250 different Bible versions and translations, but also the entire Jesus film (in more than 1000 languages), as well as dramatized versions of most of the Bible translations. The app's motto is "faith comes by hearing", so there's a strong emphasis on audiovisual components. The full list of available translations can be found on Bible.is. This app is by far the most extensive in terms of coverage of Bible translations in different languages. Most of them are old translations that are already in the public domain, but a few recent ones are also included. None of the Bible translations can be downloaded for offline use. Additional functions and features are very basic. Not even a search function is included. The app is ideal for individuals who regularly reach out to people from other cultures, and want to share their faith with those who speak a different language. For Fire TV devices, there's a separate version of the Bible.is app, that has only the various audio versions of the Bible (both dramatized and plain), and no written versions. Additionally, this app can connect to a number of radio streams. The YouVersion app is one of the most popular Bible apps, despite the somewhat silly name, and has a lot to offer both in terms of available translations and functionality. It includes Bible versions in about 1000 languages, many of which can be downloaded for offline use. Some of them are also included as an online audio version. The app has been issued by LifeChurch.tv. You can find the full list of translations on Bible.com. LifeChurch.tv is partnered with many of the most important Bible Societies and Christian publishers such as the International Bible Society, Zondervan, Wycliffe, the American Bible society, and Crossway, therefore they can offer such a broad range of translations for free. The And Bible is the Android app associated with the open source SWORD project at the Crosswire Bible Study website. For a list of Bible versions and other included resources you can check there. Crosswire is dedicated to Public Domain versions, and other works such as commentaries and dictionaries, and currently features about 40 English Bible translations altogether. All works can be downloaded for offline use. Big plus of the app is its overall slickness, speed, and very low system requirements. It will run on almost any device without issues. The user interface is very basic and straightforward, which makes it very intuitive to use, but on the other hand lacks enhanced functionality. Bible Gateway is part of Zondervan, the publishers of the NIV and other Bible translations. The app includes all Zondervan Bibles, and many more. A full list can be found on the Bible Gatway website. The Bible Gateway app provides a solid set of translations and other resources, both for online and offline use. A special highlight is the inclusion of some of the most popular Bible translations in audio format, however, this feature requires an active internet connection. The Roman-Catholic Church as the largest Christian denomination gets some special attention with the Laudate app (formerly CatholicOne) by Aycka Soft. This is a collection of many Catholic resources including two Catholic Bible translations, Vatican documents, prayers, liturgies, confessions, stations of the cross, the catechism etc. It is affiliated with the Roman-Catholic TV station EWTN, and can, therefore, also play the ETWN live stream, as well as streams of previous programmes. The publisher has obviously taken great care to collect writings and functionality that are important for daily spiritual life into a single app, though with only two Bible versions, the selection is a bit poor in that aspect, especially since only the ancient DR version is available for offline use. The Catholic Study Bible App Ignatius-Augustine Edition (formerly Lighthouse Catholic Media Bible) is one more dedicated Roman-Catholic app, focusing on both audio and written content. The free version comes with the RSV for offline use, and, as a special highlight, a 22 hour audio drama of the entire New Testament. The app is mainly focused on content, and comes with the option to download loads of audio and text commentaries both for free, as well as paid purchases. Purchases can be made through the Lighthouse Catholic Media Store. The publisher is associated with the Augustine Institute, and the most prominent contributor is Dr Scott Hahn, who has recorded hours and hours of audio commentary for the app. All included works are studded with hyperlinks, many of which lead to paid resources. Therefore, as with all freemium products, the app increases in usability when you decide to invest money. Of all Bible apps that we have tested, this one is the only one that runs on Fire TV as well. OliveTree is a freemium app that initially comes with a massive library of free Bible versions and other works, including the NIV. All resources can be downloaded for offline use once purchased (be it for free or for money). Free books regularly change over time, so that you can build a free library easily. For example, the NIV was only available at cost in the past. Should your favourite Bible version not be included for free, then you can purchase it (in most cases) for around $10. Your library can be downloaded and installed on multiple devices, including more powerful Bible study suites on Mac and Windows. OliveTree is associates with Harper Collins, the parent company of Zondervan, the publisher of the NIV and many other Bible versions. You can shop for titles on the OliveTree Shop. This is the official ESV app by Crossway. It is plain, simple and easy to use. If the ESV is your translation, and you don't need anything else, this app is for you. Additional features like search, bookmarks etc. are included, hoverver, a bit difficult to locate. The app does not have a home screen or dashboard, but opens straight to the Bible text. The BLB is a faily new kid on the block of Bible apps, and is having a very promising start. The number of text and audio commentaries is impressive, and all of them are available for free, however, you need to be online to access them, and they are not searchable. The BLB provides the tools necessary to read the Bible in the original languages as well, such as dictionaries and interlinears. Navigating the app is still somewhat clumsy, but that should improve over time, as this is still a newcomer. Blue Letter Bible is an independent non-profit organization not affiliated with a specific ministry. The organization is dedicated to provide service across denominations. MySword is a freemium Bible app, that in the free version is not restricted in number of resources, but in functionality. For this review, we only consider the functions available in the free version. MySword boasts a very good selection of mainly public domain Bible versions as well as commentaries, dictionaries etc. all for offline download. It also has an integrated text-to-speech interface. The app allows for a lot of customizing, and lets you choose fonts, colours, rearrange the buttons etc. Navigating the app seems overwhelming at the beginning, and it surely takes a bit of time getting used to it. MySword has in fact the most complex user interface of all the Bible apps that we've tested. With respect to available Bible versions and other writings, there is a heavy emphasis on public domain works. Own modules of other translations could be created with some moderate effort, but installing them requires the premium version (as well as text files of the desired Bible versions of course). Last but not least, Superbook is a very special and unique app. CBN has created an excellent TV show that teaches children Biblical truth, and shows them how to apply it in their daily life. Chris, Joy, and their robot Gizmo get taken back in time, they meet Jesus, Moses, Abraham, John and other Biblical characters, and learn from them the basics of the Christian faith. The app includes a lot of episodes from the show for free. The second major component of the Superbook app is a reader with the text of the entire Bible which is enriched with a child-friendly commentary from the first chapter of Genesis to the last chapter of Revelation. The Bible text defaults to the NLT, which is good enough for early readers. For younger children, there's an audio version of the NLT available. The "commentary" contains quizzes, trivia, short video clips, images etc. Superbook makes learning Biblical truth fun for the young ones. My kids turn to Superbook as frequently as they turn to their favourite games, without me telling them to do so. The stories are engaging, and relevant to their life.